Last summer God opened the door for us to travel to Tan Hung, a town close to the Cambodian border about a 7-hour drive from Binh Chau. 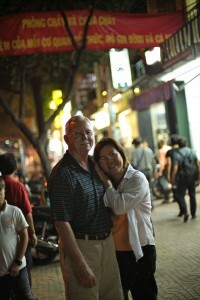 We discovered Tan Hung had no Christian church and all the people we met had never heard the Gospel before. God gave us the opportunity to share Jesus with several people and 12 of them asked Jesus into their heart as their Lord and Savior. Our new brothers and sisters in Christ expressed a desire to come visit our church in Binh Chau. We rented a van for them and about 20 people arrived in Binh Chau a few days later. God gave us the privilege to share Jesus with those in the group who hadn’t heard the Gospel and 8 more people prayed to receive Jesus. Hallelujah! What a Savior! These new believers were then baptized and headed back to Tan Hung with new Bibles and plenty of Gospel tracts in hand, but without someone to lead and disciple them. We encouraged them to meet together to worship, pray, and read God’s Word until God provided a pastor/evangelist for Tan Hung. Some actually started to travel to the nearest Christian church in a town 30-40 miles away, but it is very difficult for most of them to make that trip weekly. 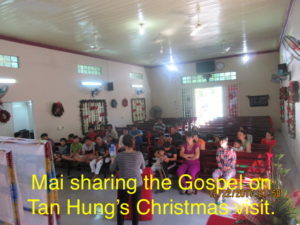 As we mentioned in our December newsletter, we rented a bus so about 40 people from Tan Hung could attend our Christmas Evangelistic Outreaches at the Binh Chau Church. God gave Mai the opportunity to share Jesus with the non-believers (picture above) and 13 asked Jesus into their heart (picture below). Cam On Chua (Thank You Lord)! In these 3 interactions we now have more Christians in Tan Hung (33) than most house churches in Vietnam. What a harvest field we have before us! We know there are no coincidences in God’s kingdom and firmly believe God brought us to Tan Hung for His purpose and glory. God has not only put a vision in our heart to plant a church in Tan Hung, but reach out to the children with opportunities for them to attend school. We have been told that 50-60% of the people in Tan Hung have never had the opportunity to attend school. In fact, we met a family of 4 generations in Tan Hung with no one in their family ever learning to read or write. 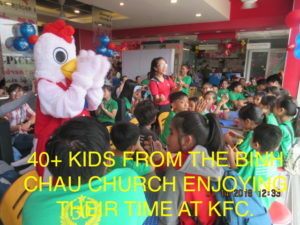 What an opportunity to implement our school sponsorship program that God has blessed us with over the past few years at the Binh Chau Church (72 children attending school this year sponsored by many of you). Through this program we have educated parents about the importance of an education for their children and seeking Jesus in their lives (a requirement for school sponsorship is their child must attend Children’s Church). Please join us in prayer asking God to raise up a pastor/evangelist to go to Tan Hung to disciple all the new believers there. Please pray God will also provide the funds to support this pastor and to plant a church in Tan Hung. We are always looking for ways to get the kids excited about reading and memorizing God’s Word. Each week at Children’s Church the kids are given a scripture to study and memorize for that week. When they return the next week they are asked to write it out and turn it in to their teachers. Over the year we keep track of which children excel and reward them at the end of the year. 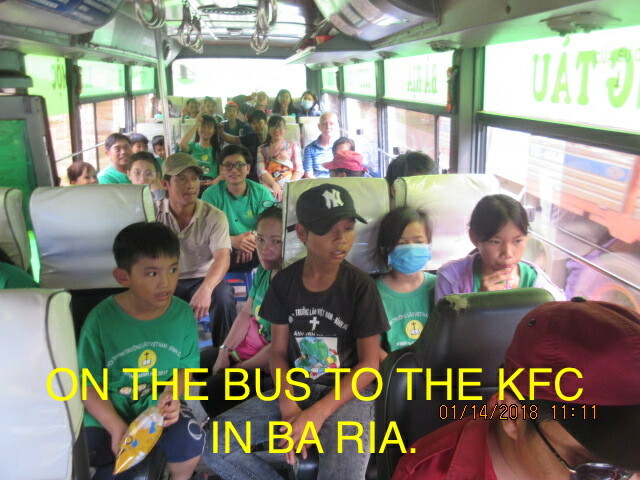 Last month we rented a bus (picture above) and took 40+ kids to the KFC in Ba Ria, about a 45-minute drive from Binh Chau. The children love going there and this year KFC provided their “chicken” to entertain the kids and give out small gifts (picture below). The kids (and us) had a great time with lots of laughter and joy. Plus, they enjoyed a delicious meal with a sweet time of fellowship and bonding. Please pray God will give all the children attending Children’s Church a hunger for His Word and a heart to tell others about Jesus. Please pray God will give us (Pastor Luong and us) wisdom to discern whether God has called Pastor Luong to serve at the Binh Chau Church for a short season or a longer season. Please pray God will raise up a Youth Pastor or Youth Leader for Children’s Church. Please pray God will give the Binh Chau Church Witnessing Teams many Divine Appointments as they go out each week in hopes of sharing the Gospel. Please pray God will give us wisdom and guide our steps as we start planning for this summer’s VBS camp. Please pray God will provide all the sponsors needed for the children that will attend. Please pray God will draw many children to faith in Jesus through this year’s VBS camp.